Minorities: Minority communities in Somalia including Bantu (or ‘Jarir’) and artisan or ‘caste’ groups (Gaboye or Midgan; Tumal and Yibir), and the Benadiri. Primarily women in these communities. To contribute to improved gender equality, reduced violence against women and increased access to justice (with a particular focus on women in minority communities). To empower minority women and girls, to build the capacity of minority organizations to work on gender issues and of gender organizations to include minority women, and to support lobbying for policies that include and benefit women. Minorities are estimated to form one third of the population of Somalia, however, they are rarely considered in policy design. Minorities as a whole are marginalized and invisible. Minority women are even more sidelined and excluded. Unlike majority clans (such as the Darod, Hawiye, Dir and the Rahanweyn) minority groups do not benefit from a traditional clan structure that affords them some degree of protection, regardless of the conflict. They have already suffered marginalization and exclusion from mainstream economic, social and political life, thanks to a legacy of slavery, customary segregation, dispossession and displacement. There is an urgent need for action to empower, protect and promote the rights of women from minority communities, who experience multiple-discrimination on account of their gender and minority status. Face-to-face training programme covering minority rights, multiple discrimination, advocacy and media skills. Minority rights distance learning package for women. Work with journalists to research, produce and present three media programmes that focus positively on the contributions of minority women. Capacity-building grants for smaller civil society organizations and minority women’s micro-projects by grantees. Who is delivering this programme with us? This evaluation examined the work done on the issue of the multiple discriminations affecting Somali Minority Women by Minority Rights Group and our partner organization IIDA from October 2012 to January 2015. The program was implemented in three regions of Somalia, in Kenya, in the UK (London), and in Switzerland (Geneva). 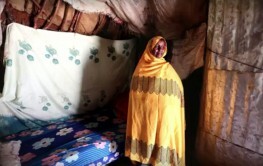 The specific goal in mind was to empower minority women and girls, to build capacity of local minority organizations to work on gendered issues, and to encourage organizations to include local minority Somali women in advocating for their own rights. The evaluation eventually reported that “civil society networks have been established and they have been instrumental in championing minority women’s rights issues at different levels of the Somalia society, from the community level to decision making level in parliament.” This was made possible through trainings, awareness creation, lobbying, and advocacy interventions conducted at all different levels of the project. The project was expected to give decision makers and stakeholders access to detailed, accurate, and authoritative information about the daily lives and rights abuses of Somali women. Additionally, it hoped to have at least 40 people demonstrate increased knowledge of minority rights, minority discrimination, and NGO management issues. Finally, it hoped to have five CBO’s with a higher capacity to work on these issues, and an increased access to justice for victims. The evaluator found that each of these targets had been achieved.